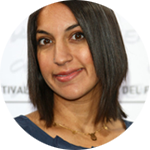 Iranian-American filmmaker Suzi Yoonessi’s award-winning feature film Dear Lemon Limapremiered at the Los Angeles Film Festival where it received a special jury award. The film traveled internationally to renowned festivals garnering awards, including the Grand Jury Prize at the SF International Asian Film Festival. It was released by Phase 4 Films in 2011. Yoonessi is currently developing the series Olive and Mocha, which is based off her viral video, which was Funny or Die’s 1st Annual Make Em’ LAFF award winner, and the #1 video on Reddit for a week. After completing the 2014 Warner Brother’s Director’s workshop, she directed her first television episode, Amazon Studio’s critically acclaimed Gortimer Gibbon’s Life on Normal Street and continued to collaborate with Funny or Die on viral videos. Yoonessi received her BFA from the SF Art Institute, and her MFA from Columbia University where she was a recipient of the FMI Directing Fellowship.